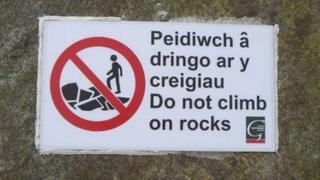 A council has been criticised for its "ridiculous" decision to put warning signs on rocks at a Gwynedd beach urging people not to climb on them. The signs are on about six large boulders which were used to create a man-made headland at Tywyn Beach. Mike Stevens, chairman of the Tywyn Chamber of Tourism and Commerce, said the signs were "health and safety madness" and were an eyesore. Gwynedd council said the rocks were a "risk" as there were gaps between them. The boulders and rocks were used to create a headland as part of a £7.6m Welsh government sea defence scheme. Mr Stevens said the headland had become extremely popular with locals and visitors to the beach and had been used for people to sit on for picnics, and by fishermen and sunbathers. But he noticed the A4-sized signs had been stuck to the rocks along approximately a 50m stretch of the headland. "I thought it was insane. Not only do they look dreadful but I think the councils are being killjoys," he said. "It's as if they have seen people enjoying themselves on the rocks and want to stop it." Mr Stevens said he had been in touch with the council to try to find out why the signs were necessary, but still did not understand the reason they had been used. "The council are saying the signs have been put there because the headland is man-made," he said. "But I think it's probably safer than normal rocks. These boulders haven't just been dumped there - they were strategically put there and they are flat facing - there are no jagged edges sticking up and they have flat tops. "They are also really huge and were put in a trench that was dug, so they probably move less than normal rocks." Mr Stevens said he was concerned about the image given off by so many warning signs on the beach. "It sends out a negative message. It's effectively saying this beach is dangerous," he said. "But as far as I'm aware there have been no incidents on the rocks, no complaints or accidents. People were just enjoying the rocks." Gwynedd council said it had a "duty of care" to the public. A spokesperson said: "The headland breakwater is a man-made structure which poses a risk to those who attempt to climb onto the structure. "The rocks that were used in its construction are significant in size and weight and, as a result of their careful positioning, significant voids form an integral part of the structure and have been incorporated into the design in order to reduce wave energy. "These voids together with the slippery surface of the rocks pose a significant risk, and it is for this reason that we will continue to warn members of the public not to venture onto the structure. "Should a child or any other individual become entrapped in the structure for whatever reason, then the risk would be significant due to the majority of the structure being affected by the tide. "Gwynedd council has a duty of care to ensure that members of the public are warned of any danger that they may encounter, and therefore the signs are in place to inform the public and to minimise the identified risk."